The fishing conditions have begun getting tougher by the day as the local reservoirs are being prepped for the spring run-off. This means a lot of mud and poor fishing for a week or two. Don’t fret though, as the reservoirs will come into shape soon and will again begin to produce nice fish and good fishing. In the meantime, your best options remain the Lost River, the Snake River and the Salmon River. Keep an eye on the flows for all of these. The conditions are changing daily and staying current on the flows and turbidity is a must for a good day on the water. The lower Lost River through Mackay is fishing well, but please keep an eye on the gauge: www.waterdata.usgs.gov. If the flows remain in the 300CFS range, you can count on decent wading and great fishing if you hit the right day. Anglers are reporting great action on red colored nymphs like always, and with the right weather there can be some decent Baetis dry fly action. If you see the gauge jump way up, then think about heading elsewhere. The Snake River provides a wonderful Carp fishery this time of the season. With a quick look at Google Earth anglers can find lots of shallow water flats to hunt these fish. Fishing Carp in shallow water requires the exact same technique you would use on a Bonefish or Permit. It is a great way to warm up for a Saltwater trip or even learn how to Saltwater fish before your first trip. Hunt these fish and then try to drop Damsel Nymphs right on their nose. A few strips and hopefully you can fool these big, hard fighting fish! Finally, the Steelhead are coming up the Salmon River and anglers are catching a few. Again, be sure to check the conditions as clarity is an important factor, if not the most important as anglers look to site and stalk these fish. Be aware the Steelhead are in the last few miles of their 900 mile journey into Idaho. They are here to spawn and the spawning beds, or Redds, are apparent from the clean swept gravels in the shallow water. Avoid fishing these areas and stepping on them. Don’t forget Picabo Angler is having another great party on the 24thof May! That is the night before opening day! Grab your tent, your friends and plan on another fun evening to kick off the season! February brought a dose of much needed precipitation to the valley, and snowpacks throughout our watersheds are healthy. Silver Creek north of Highway 20, along with Kilpatrick Pond, remains open until March 31st. Streamer fishing continues to be the most productive technique and will entice some of the creek’s largest browns and rainbows. Midge activity should increase daily, offering anglers a chance for some incredible late winter dry fly fishing on Silver Creek. The Big Lost River below Mackay Dam will become one of the area’s better fisheries this month. Midge activity has been on the increase and will only get better as March progresses. In addition, spring Blue Wing Olives will hatch throughout the river system towards the end of the month, providing some exceptional dry fly fishing in the afternoons. Look for surface feeding fish along foam lines, current seams, and in the slower tailouts of pools. A good selection of Griffith Gnats, Trailing Shuck Midges, Tie-Down Midges, Film Critic BWOs, Parachute BWOs, Last Chance BWO Cripples, and RS-2s in sizes 18-22 will take rising rainbows on the Lost. Nymphing remains an excellent technique, and don’t be caught on the Lost without black and red Zebra Midges in sizes 16-20! Other effective patterns include San Juan Worms, Copper Johns, Rainbow Warriors, Cranefly Larva, and black Rubberlegs. Flows out of the dam are at approximately 200 CFS; with a healthy snowpack and Mackay Reservoir near capacity, flows could increase at any time. Give a call to the shop or check the USGS web sites for current flow information before you make the drive. Fishing on the Big Wood River remains productive. Anglers are having success nymphing, fishing midge dries, and throwing sculpin patterns for the river’s biggest fish. Look for the best midge activity to occur during the afternoons. Griffiths Gnats, Trailing Shuck Midges, Sprout Midges, and Zebra Midges should all be in your Big Wood winter fly box. Please keep in mind that many rainbows begin to spawn at the end of the month, so keep an eye out for redds and let spawners do their thing! A fantastic amount of winter weather has set the fishing on fire in the Sun Valley / Picabo area! With more of this cloudy wintery weather ahead of us we can expect another round of great midge hatches, and more of the big fish out and about looking to eat under the dark skies. Silver Creek has been fishing pretty well. The fishing varies from pretty good to off the charts depending on what day you fish and how “bitey” the fish are. The one thing you can count on is the big fish are out under the dark sky and under the cover of the turbid water. When this happens anglers have their best chance of the season to lay into a very big Brown Trout and even some good sized Rainbows. Streamer fishing is the name of the game on the Creek in the winter, so come armed, or stop by the fly shop and we’ll get you the right patterns. If you are interested in fishing private water inquire when you are in the store. We have a modest rod fee on some great winter water. The Big Wood seems to always fish well when we see big winter storms. The fish and insects in this river react to low pressure systems with abandon. 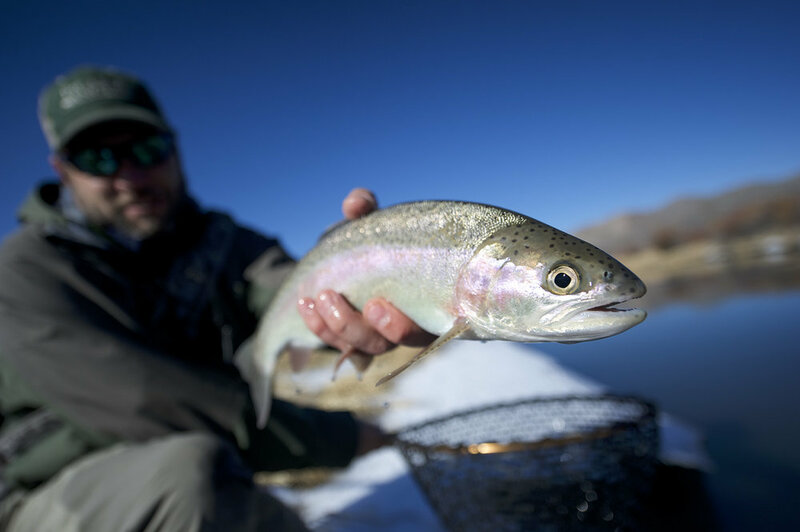 Big hatches get the fish up and eating, even during the duration of the heaviest snow falls. The wintery weather also has the fish so fired up it is a great time to fish Nymphs like Zebras and Girdle Bugs, as well as Streamers like olive colored Buggers. If you get a chance, pop into Lost River Outfitters and ask for Filo-Beto. This olive Streamer will get the job done on the Wood River! If you haven’t been to the lower Lost River this winter, think about making a trip between storms and staying for a few days in Mackay. This can be a great little respite for local anglers looking to get out of town for a few days, and it’s a great option for visitors looking for a slightly different experience than the Big Wood. The South Fork of the Boise, is another option, but we do try to avoid the canyon when winter weather sets in. It is not uncommon to drive all the way to the hill above the dam, only to find it closed from top to bottom. Get out and have fun in this weather, but please be safe doing it!